MADRIX allows you to quickly produce an extraordinary light show. This is the purpose and probably most important part of the software. ▪ The term MADRIX Effects includes all lighting visuals and patterns you can create with MADRIX and display on your LEDs. ▪ MADRIX is a unique LED lighting controller. It is an effect generator with a graphics render engine and also includes media server features. ▪ You can use the integrated effects of the effect generator or external content [such as images or video files]. ▪ MADRIX allows you can create stunning real-time lighting visuals with ease. ▪ Choosing a lighting effect is simple. ▪ Thanks to its user interface layout, MADRIX includes 2 dedicated areas [Effect Area Left and Effect Area Right]. ▪ By default, SCE Color is selected. ▪ A drop-down list allows you to select a MADRIX effect. ▪ Simply click on SCE Color to select a MADRIX stock effect from the list. ▪ Click on the MADRIX Effect in order to select it. ▪ Every single MADRIX Effect has different controls to easily customize how the effect looks and behaves. ▪ Extra settings provide further option for customization. In addition, you can combine each effect with every other effect. This allows you to create an unlimited amount of different lighting effects. 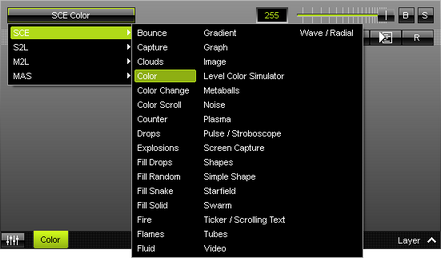 MADRIX offers certain possibilities to manage and organize your effects. ▪ Effects will be automatically saved in the selected Storage Place. ▪ MADRIX offers 256 x 256 Storage Places. Hence, you will be able to create a lot of effects and storing is automatically handled by the software. ▪ On the other hand, Storage Places and other configurations are ultimately saved in MADRIX Setup files. Do not forget to regularly save your MADRIX Setup file!